Being #Noseblind Can Cause Embarassment! Febreze Can Help! Did you know that you can become Noseblind to odors in your home? Basically, you are so used to smelling them that your brain decides they’re not important. Eventually, you have no idea that there is an odor in your house! I kind of knew that, but never really gave it a whole lot of thought. Since we’re having a ton of guests over this weekend, I wanted to get a couple of my close friends to do a “Noseblind test” with me to make sure my house is ready. We’ve been cleaning a lot, so I figured it should have been good to go! Here’s the thing: I have two old dogs, and they have that “old dog” smell (or so I’m told). I also have a house full of carpets, which absorb odors like there’s no tomorrow! For the Noseblind test, we had ourselves a little movie night get-together. We made buttery popcorn and watched some Buffy the Vampire Slayer (because I’m still on that kick!). Before settling in, I made them take surveys online saying how they thought my house smelled. They weren’t supposed to share that with me until the end of the night. What I discovered is, as I mentioned, the “old dog” odor is a bit prolific. Since I’m not getting rid of my dogs, I need to find a way to get rid of that odor! That’s where Febreze came in. Febreze makes so many great products that can help eliminate odors in your home, including those you don’t even know exist! I wanted to see how fast Febreze could freshen my home. I started by spraying the Febreze Fabric Refresher on my sofa, where my pups often sit. Next, I used the Febreze Air Effects room spray. This worked the fasted, in my opinion. It not only replaces the odors without something nicer, it completely refreshes the air in the entire house. Even if you somehow manage to not have a single odor in your home, this is still a great product to use! My favorite of the Febreze products is the NOTICEables plug-ins. These don’t have quite the immediate effect as the sprays, but they last a really long time. 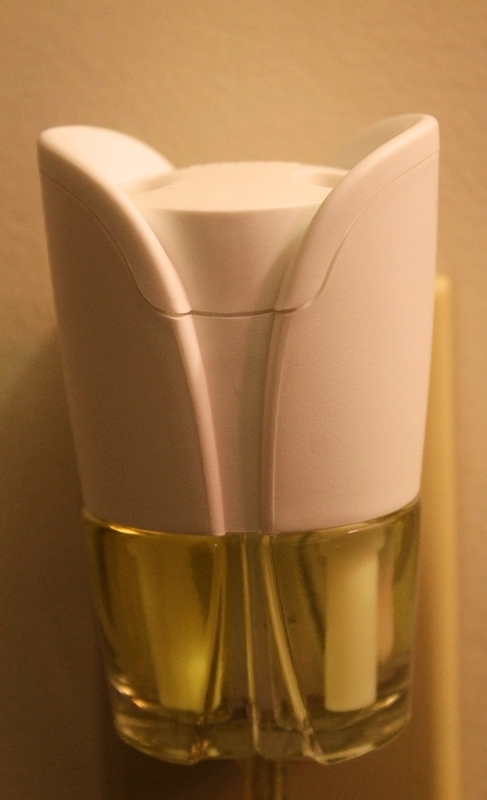 I love that it alternates scents so you don’t get bored of the same one! Plus, it makes each refill last longer. I also love that it’s pretty unassuming, so it doesn’t clash with decor. Overall, my guests said that the old dog odor wasn’t noticeable after using the Febreze products! So now I know before I start my big party this weekend, I’ll spray and refresh the place with Febreze! 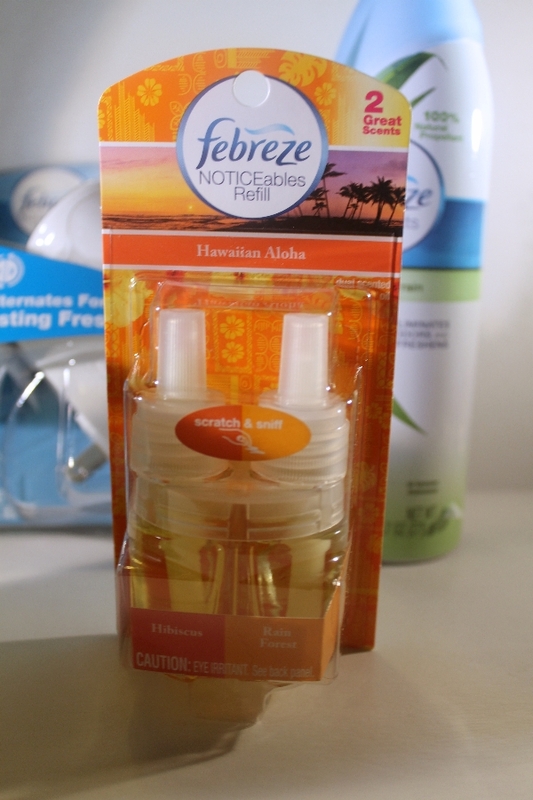 Learn more about being Noseblind and how Febreze can help! 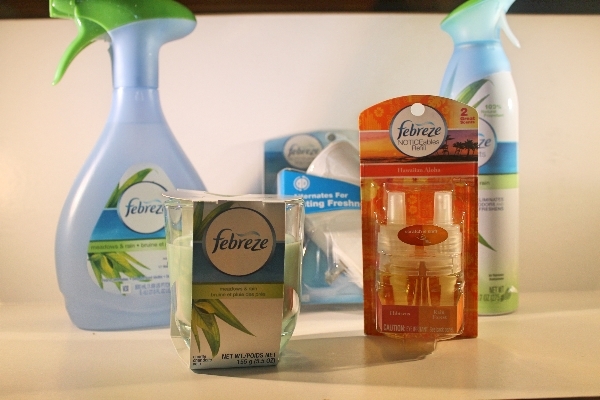 Want to try out all the Febreze products that I used, plus get a $60 AMEX gift card? Enter below for your chance to win! Giveaway is open to US residents age 18+ and ends on August 6th. What odors do you think you may be Noseblind to in your home? We live in a small space–I think even last night’s dinner might still be around. maybe musty odors are lurking but i’m noseblind to them. I think I’m probably noseblind to my dog! I might be noseblind to previous meal odors. I am noseblind to my dog and cat. Other people that come over can smell them, but I can not!! I’m noseblind to dog odor. The kids and dogs. LOL! I’m now immune to how my dog smells! I might be noseblind to pet and garbage odors. Lurking in my home is pet/dog odors! I think I am noseblind to pet odors. I guess I could be noseblind to the trash can in my home. I am noseblind to my dog’s odor. I have a musty smelling basement that I can no longer smell. I thought it had dissipated, but if I am away for a few days I can suddenly smell it again. It makes me worry about other things I am “noseblind” to. Odors from having cats in our home. I might be noseblind to pet odors like the litter boxes in my home. I have probably become noseblind to cat box odors. Food smells I am noseblind, Thank you! I think I can smell them! We use Febreze fabric freshener on our furniture regularly against pet odor. my cooking and the diaper smells! I’d like to hope nothing – but maybe litter box odors? As much as I love my puppy, I’m probably nose blind to him. My two cats. Need I say more? I know that I have cat odors from time to time. I also have teen boy odors. I’m scared out house smells like doggy. We got a new puppy a few months ago and I worry that she has made the house smell. I don’t smell anything but you know how that is. lol Thank you! The garbage can at the end of the week gets stinky! Definitely with one dog and one cat, I would say animal odors! There are probably little boy odors when my grandsons come to stay that I am not aware of. I probably don’t notice the cooking and pet odors. I’m probably noseblind to kitchen and cooking ordors. I have a dog and a cat and a bird I am noseblind to their odors. We’re careful with it but you never know. I have pet and cigarette smoke odors. I hope none! probably some dirty laundry smells though. I am noseblind to the scents of my three furbabies! I think cooking odors liner in my house. Cigarette smoke and cooking odors are two of my biggest odor concerns. With 2 Dog’s I’m Sure I Have Pet Odors In My Home That I’m #NoseBlind To. I’ve grown noseblind to cooking smells. with three cats, I am now noseblind to their smells, I need to get some febreee products so I don’t stink out the guests. I would say my noseblind is probably the three dogs and the cats odors. My son’s soccer gear has an odor all it’s own and I have become used noseblind to it! Well it use to be the cat liter box, now that it is gone, we are no longer noseblind to that. Now it would be my hubby’s stinky work boots after him working out in the hot sun all day. At least I hope I get noseblind to it, lol. Oil from the deep fryer stinks for so long. We could possibly be noseblind to bathroom or laundry odors. Yikes! I would like to get rid of that wet dog smell. I have teenage boys so I’m sure there could be some of that “stinky boy” smell, LOL! Probably my own gas, to be honest. I think maybe our dog. I’m most probably noseblind to litter box odors! I’m sure I’m noseblind to my pets’ odors. Probably leftover cooking odors is my culprit. I do love Febreze products. My four dogs have an odor that I’m noseblind to. Definitely cat odors, especially around the litter box. Thanks for hosting! I think I am noseblind to the odor of the cat litter box, I also have two dogs so I am probably noseblind to their doggy smells too. We have two dogs and two cats in our home so I would say that I am probably nose blind to the pet smells in our home. I’m probably noseblind to the litter box. Cat litter and teenage boys! Cooking odors, especially onions, we cook a lot. I am sure we are nosebling to the wet dog smells in our house. The odors I think might be lurking in my home that I may be noseblind to are pet odors. I have a dog, cat, and two birds. My biggest odor problems are my two big dogs and two smelly little boys. With two dogs and two cats I would say it is pet odors.!!! I am noseblind to the odor of my dog. My dogs smell is lurking I believe i am noseblind to them, my husband will come home from work and say what is that smell and I don’t smell it!! Our biggest culprits are the strong spices we use when cooking, which tend to linger in the air for ages afterward — we have definitely become immune to the smell over time! The kitty litter box and cooking odors I’m sure are noticeable to everyone else. I think we have spicy cooking smells. I have two dogs and I always worry that I am noseblind to their smells. I’m probably noseblind to my recycle bin odors. I think I am noseblind to my dogs odor. With 3 cats and dogs I think I am noseblind to pet odors. I am noseblind to pet odors. Probably pet and food odors. Thanks for the giveaway…on occasion, we have found that cooking odors from the night before seem to present themselves.